Chinese policy makers appear to be favoring hybrid vehicles with subsidies. BEIJING – With the dust now settled from last month’s handover of power in Beijing, policymakers responsible for China’s auto sector seem to be favoring hybrids as a step toward expanding green-vehicle use. The initial stage of the push to promote so-called new-energy vehicles, and with them a differentiated technology standard that China can export, now is widely acknowledged to have failed, at least regarding promoting sales of battery-electric vehicles. Data from the China Association of Automobile Manufacturers (CAAM) shows only 12,791 new-energy vehicles were sold in China last year, the vast majority to government projects. A little more than half were passenger vehicles (public buses accounting for most of the remainder), and these were spread across a range of domestic suppliers, with Chery’s QQ3 electric vehicle the top performer with 3,129 deliveries. 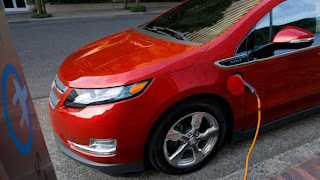 Industry sales primarily were EVs, but including a handful of hybrid-electric, plug-in hybrid-electric, solar, fuel cell, natural-gas hybrid and liquefied-petroleum-gas-fueled vehicles. This is far from the government’s interim target of having 500,000 green vehicles on the roads by the end of 2015, let alone its projection for 5 million by 2020. These frustrations were voiced by Beijing Automotive Group Chairman Xu Heyi, who told a press conference in mid-March that government sales accounted for almost all his state-owned company’s 2012 sales of 1,000 alternatively powered vehicles. This is because of an underdeveloped recharging infrastructure: Beijing has just 47 EV charging stations, compared with 67 in Geely’s headquarters city of Hangzhou. And while Industry Minister Miao Wei last month affirmed the government’s intention to continue encouraging green-vehicle sales though consumer and producer financial support for another three years, more flexibility is planned, including more subsidies for hybrids. Notably, a new tier system will base subsidies not on vehicle type but on its energy-saving potential. One plan stipulates offering RMB3,000 ($483) per kilowatt-hour capacity of an auto battery, which can cover hybrids as well as EVs. A 3-year trial program that expired in December provided a subsidy of RMB60,000 ($9,500) for the purchase of EVs and RMB50,000 ($8,060) for plug-in hybrids. Hybrid electrics were eligible to receive just RMB3,000, but the new subsidy framework removes the restrictive focus on EVs, to which the domestic industry so far has failed to respond. “A shift is now taking place whereby the government is moving towards encouraging hybrid vehicles as a stepping stone to increasing the number of cleaner vehicles,” IHS Automotive analyst Namrita Chow says. Industry-watchers say the central government’s promotion of hybrids could favor foreign auto makers and joint ventures, given their superior quality, reliability and warranty protection. “I think global players like Toyota will benefit the most,” says Boni Sa, IHS Automotive’s China light-vehicle production manager. “Even if the government subsidizes hybrid vehicles in China, the hybrid cars will still be more expensive than the conventional models for both global and domestic” brands. The FAW-Toyota JV is developing a hybrid version of the Corolla, Sales Manager Zhang Sijun says, and will increase investment in other hybrid models going forward. A BMW China spokesman confirms new-energy vehicles will be the focus of a forthcoming JV brand under the German auto maker’s existing arrangement with Brilliance Auto. Another potential weakness in the revamped green-vehicle policy is the ability of local and city governments to have different policies, which might discourage the development of vehicles that are salable elsewhere in China or abroad. Even as industry minister Miao was announcing the central government’s new subsidy program, officials in Tianjin, Shenzhen and Guangzhou were issuing details of their own, unrelated policies to stimulate local investment, prompting Yesheng Ji, deputy secretary-general of CAAM, to warn against such local protectionism. “The pilot allows for multiple solutions to coexist. Different companies and local governments have different approaches – there’s no consistency,” says Bill Russo, a Booz & Co. senior advisor who cites BYD’s partnership with multinational ABB Group to develop charging infrastructure in Shenzhen as an example. Wang Binggang, chief consultant to the Chinese government’s push to promote new-energy vehicles under the 11th Five-Year plan, wants the new subsidies extended throughout the green-vehicle chain, from auto makers to charging stations and upstream parts-replacement facilities. Whether the new program adopts this kind of structured approach, even offering electricity tax concessions to users of EV charging stations, will go a long way toward determining its success, he says. “The difficulty with reform in China is that the local regions can do a lot of stuff out of sight,” says Greg Anderson, principal at Pacific Rim Advisors. “They have been hammering on about auto industry consolidation, but that has not happened. There are new firms springing up all the time, because local governments are incentivized by economic growth. Yet, Anderson also offers a note of cautious optimism. “(Premier) Li Keqiang is a trained economist – he gets this. There’s been a change at the top, there is the possibility of change, but we don’t know how effective it will be for years,” he tells WardsAuto. Russo expects immediate progress in green-vehicle sales to public-transportation operators, including taxis. This could lead to more government vehicles going electric, although issues including public sanitation and postal service must be addressed before top officials abandon their premium black-tinted-window Audis. General Motors Co. and Volkswagen AG, the largest foreign carmakers in China, both forecast sales will climb to 3 million vehicles in the country this year as the rivalry heats up for a second year. GM is “cautiously optimistic” and expects its sales to reach that level if market fundamentals are strong, Bob Socia, head of China operations, said in an interview at the Shanghai Auto Show yesterday. His Volkswagen counterpart, Jochem Heizmann, said a day earlier that the German carmaker expects deliveries to reach that number or beyond. Both companies sold about 2.8 million vehicles in China last year. The projections signal competition -- GM’s lead over VW in China shrank to less than 1 percent in 2012 -- will intensify as their sales slow in their biggest market. At stake is supremacy in China, which may become the first market with more than 20 million vehicle sales this year, and where car-ownership levels are still a fraction of those in the U.S. and Western Europe. “In terms of their presence, GM may be in a better position with their strong network and a more complete product portfolio,” said Bill Russo, president of automotive consultancy Synergistics Ltd. Still, most carmakers “are probably anticipating market expansion to be not as robust as it has been in the past, and the supply-and-demand imbalance is creating additional pressure on pricing,” he said. Wolfsburg, Germany-based VW, facing a European auto market headed toward a 20-year low, is seeking to rebuild its image after a state broadcaster’s report on defective gearboxes in VW cars prompted the German company to recall a record 384,181 vehicles in China. Heizmann expressed his personal apologies over the matter at an April 19 event in Shanghai. Apologies may not suffice. More than a dozen stone-faced riot police in black flack jackets and helmets lined the VW stand yesterday morning. Across the aisle at the Buick stand, a young American couple modeled beside the Riviera concept car, where a man wore a silver shark-skin suit evoking Frank Sinatra, while female models preened in a metallic silver sheath mini- dresses and high heels. The incident hasn’t deterred the German company’s expansion plans. VW forecast it will increase its China line-up 29 percent to 90 models by 2015, invest 9.8 billion euros ($12.8 billion), and expand production there 60 percent by 2018. GM, which outsold VW in China last quarter after trailing the German carmaker for two quarters, isn’t ready to relinquish the lead. The company showcased a record 53 vehicles at the Shanghai show, including the Buick Riviera concept vehicle, the Chevrolet Cruze hatchback and Cadillac Escalade ESV. The company plans to spend $11 billion in China by 2016. Still, GM is mindful of the competition and China is a market where margins will “always be squeezed,” he said. There’s more to China than just GM and VW as other previewed their offerings to Chinese consumers at the Shanghai show. Sport utility vehicles -- the fastest growing segment of China’s auto market -- stood out. Honda Motor Co. showed its concept Acura SUV-X that will be produced in China, Ford Motor Co. said it plans to debut two small SUV models in the market this year, and Daimler AG showed off its planned Mercedes GLA. Chrysler Group LLC’s Jeep, which became the first western auto brand built in China in 1983, may resume Chinese production by the end of next year, starting with the Cherokee, Mike Manley, head of the brand, said in an interview. Ford has received an “incredible” number of pre-orders for its EcoSport and Kuga SUVs that debut this year, Jim Farley, the automaker’s global marketing chief, said in an interview. At GM’s Cadillac stand, a pearl-white Escalade ESV rotated on stage as a model in a white brocade gown posed for a throng of photographers. Curious showgoers piled into the front and back seats of SUVs at GM’s Buick and Chevrolet stands. Automakers have reason to be optimistic about SUVs. Sales of the vehicles will probably rise 23 percent to 2.46 million units, outpacing all segments in 2013 for a second straight year, according to the state-backed China Association of Automobile Manufacturers. Chinese SUVs are also doing well, with Great Motor Co.’s sales of its Haval vehicles surging 92 percent during the first quarter. Luxury carmakers continued their push to capitalize on China’s growing number of wealthy consumers. Daimler said it plans to increase its number of dealers by about 30 percent this year and BMW’s Rolls-Royce is planning to expand its network by 25 percent. The Chinese market, cluttered with more than 90 brands of vehicles, may get even more crowded as Volvo Cars and Jaguar Land Rover prepare to begin production in the country. The extent of the choices available, can sometimes overwhelm consumers. Nissan Motor Co.’s Infiniti will make two long-wheelbase models in the country, following VW’s Audi, Daimler’s Mercedes and BMW in stretching the length of their vehicles to cater to Chinese tastes. Nissan, which outsells Toyota Motor Corp. in China, said it’s expecting a 16 percent increase in sales at its Chinese venture this year as anti-Japan sentiment, triggered by a dispute over uninhabited islands last year, subsides from the protests that flared in September. Nissan, Toyota and Honda all saw their China sales fall last year, a slump that extended into the first quarter. Still, for companies such as Nissan, the bigger challenge may be figuring out how to make cars that appeal to Chinese youths. Young people today are very tech-savvy, very much connected and social media is very important, so vehicles should bring friends together in the car and allow them to share social media content, according to Nissan Executive Vice President Andy Palmer.